Bitcoin Group, which was aiming to become the first crypto company to go public through the IPO process, has again delayed its scheduled listing date on the Australian Securities Exchange (ASX). The Australia-based startup, whose primary business is the mining of bitcoins, had appeared set to finally go live on January 20 after more than a year’s worth of delays. Shares, to be listed as ASX:BCG, are now expected to go live on ASX on February 2, 2016, though this may change. The delays have allowed Coinsilium, a blockchain-focused venture investment firm, to officially become the first crypto company to successfully complete the IPO process. Shares debuted Friday on ICAP’s Securities and Derivatives Exchange’s (ISDX) growth market. Bitcoin Group’s previous change in plans was due to a request by the Australian Securities and Investments Commission (ASIC) for commentary from a bitcoin mining expert to accompany the latest prospectus. This was deemed necessary by ASIC in order for prospective shareholders to understand the company’s business. The delays underscore the rigors of the IPO process and the challenges posed by abstract concepts like cryptocurrency. However, at least one of the delays was caused by the need for Bitcoin Group to issue corrective statements. During the past few months, the company has issued one Prospectus, two Replacement Prospectuses and three Supplementary Prospectuses. The latest Replacement Prospectus, dated December 24, includes the expert’s commentary and audited, up-to-date financial information. The expert is Professor Peter Taylor of the School of Mathematics and Statistics, University of Melbourne. His 10-page report was written specifically for the Replacement Prospectus. It is presented as a scanned image, not a searchable text. 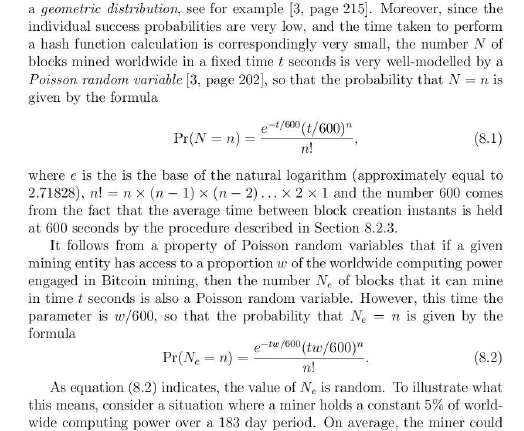 In the report, Taylor sets out the mathematical analysis underlying the mining process and the application of probability theory. One of the objectives is to provide insight into the likelihood of success in commercial mining. Excerpt from ‘Independent Expert Report: the Bitcoin Mining Process’ by Peter Taylor. Taylor makes 9 citations: one from a paper by Bitcoin expert Andreas Antonopoulos, one from a paper on the fundamentals of probability, one from the Replacement Prospectus and six from online Bitcoin information resources.